President of Artistic Approach Inc.
On too many occasions I experienced clients that did not have their art insured. It is very easy to build a private collection when you love art. Insurance will not pay art claims without proof of value. Protect your art collection and have it insured. With your Title Certificate you will receive Direct Contact Information for me so you may access all of your Confidential Art Documentation in case of loss or damage. You will be supplied with copies of all your Original Title Certificates along with an Updated Appraisal to present to your Insurance Company. You may email me once a year for an updated appraisal. Two copies of your Appraisal will be included with your paintings. One will be mounted on the back of your painting and another for you to keep in a safe place in case of loss or damage. 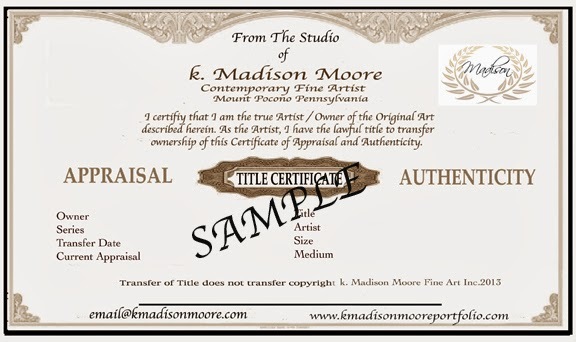 The certificate will reflect your name, all pertinent information, current appraisal value and signed by the artist. Transfer of the Title does not transfer the copyright. The Old Masters of the 14th & 15th centuries such as Michelangelo, Picasso and van Gogh used wood panels primed with a chalk like material for their work as there was no canvas. The Mona Lisa painted by Leonardo da Vinci in 1503-06 survives today and is painted on wood and in almost perfect condition and with little cracking. We make all of our Custom Hardwood Panels in our Studio Wood Shop. The panels are constructed with the best hardwoods, mahogany and maple. coats for a beautiful painting surface. I only use the best archival materials, paints and brushes for all of my work. that maybe easily removed in the future if restoration may be needed. Although they are quite time consuming to construct, I have chosen to use Custom Made, Gallery Wrapped, Linen Canvas, Hardwood Panels of Mahogany and Maple Woods, for all of my paintings and have never experienced any damage. tearing which is very convenient for storing or moving. My Custom Canvas Panels with last a lifetime plus. Although I do paint the sides of my paintings for those who prefer "not" to frame, I thought it would be nice to offer a beautiful, simple frame for those that do prefer to frame their paintings. Many of my paintings include floater frames but may still be purchased without if you prefer. 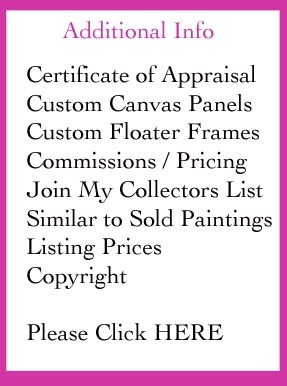 If you see available paintings that are not framed, upon request we will make a frame for you. My frames are custom made from beautiful hard woods and finished with furniture quality materials. All frames are fitted perfectly for each panel. We generally use black finishes frames but you may have any color or finish that you wish. These frames are custom made for my paintings only and not for sale to other venues. 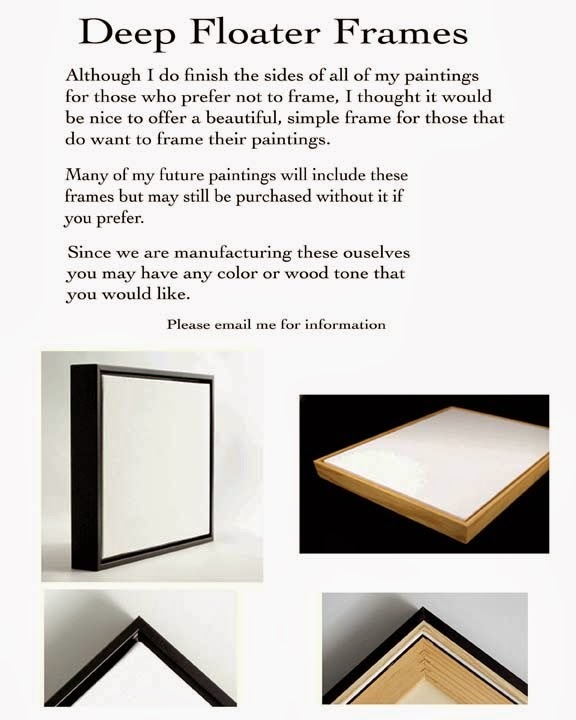 Frames are only sold with paintings. Please contact me for information. It is my pleasure to work with each collector on their commission project ideas. If you have an idea for a painting please don't hesitate to contact me to discuss it. I am sure that we can work together to design a painting what will make you happy and that will fit into your budget or price structure.There are many avenues of approach that we can discuss so please do not hesitate to ask. Please feel free to contact me for your no obligation commission quote. I am a verified PayPal Seller for 10 years. PayPal is a secure and easy to use online bank. as easily as any other internet purchase. Painting prices are based on size, design, detail and not specifically on size. are much more difficult to paint and may require more time to complete. is the value used on the customs form. and fees charged by their own country. There are no exchanges on Commissions. I am blessed to have built a wonderful collectors list over the years. Therefore, I sell many paintings and some very quickly. Once you purchase a painting you join my collectors list. purchasing my paintings over those who are not collectors. Collectors receive other additional benefits. for a painting as well. I have been asked many times why I do not list my prices. There are many reasons. them for on their websites. Artists that list prices lower on their sites may upset their Galleries as they know that artists sell at lower prices. This may result in loss of contact with the gallery. Another reason may be if the paintings do not sell in the galleries, the artists will pull them out and at that time may list them for sale on their sites. This can result in a great deal of additional work to the artists already busy schedule, just in changing prices when there may be many paintings and websites involved to update. The artist may also have collectors that collect frequently or commission many paintings that may have a different pricing structure. This is why I do not list my prices among other reasons. Because prices are not listed does not mean that the paintings may be unaffordable. In fact, you may find a painting that you like that has not sold that the artist will be happy to find a home for, so you may get yet even a better deal on this painting. Many artists paint beautiful paintings that you would think are very expensive but you may be surprised how affordable they really are. I know it is hard if a collector asks for a price and then decides they can not manage it which results in them feel embarrassed to the artists. I have heard this many times. be a pleasure. You may find something down the road from one of my sales or maybe a nice framed print or product that will make you happy. Please don't hesitate. If you don't ask, you won't know! All images of paintings and written documents are registerd under the USA Copyright Laws. Please do not copy images or information from this website without permission from the artists. Copyright theft will be prosecuted to the fullest extent of the law.